Cancun Grand Prix silver medallist Jessica KLIMKAIT (CAN) produced the performance of her career to win -57kg gold in Osaka. 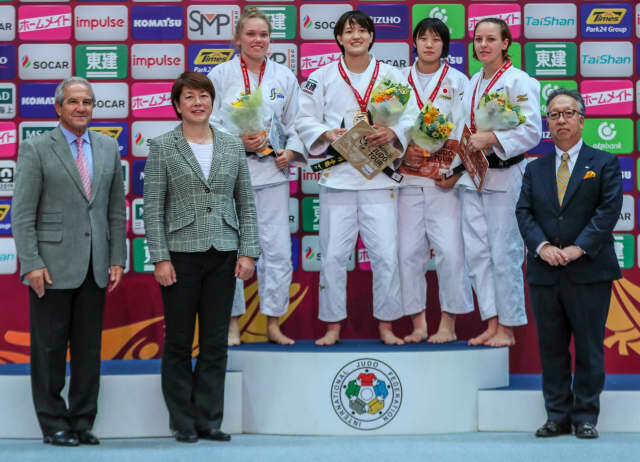 KLIMKAIT, who is locked in a battle with teammate Christa DEGUCHI in the race for Tokyo 2020, won her first Grand Slam crown at a crucial time in the Olympic qualification period with the season-ending World Judo Masters two weeks away. Three-time Grand Prix winner KLIMKAIT defeated Asian Games winner TAMAOKI Momo (JPN) in the final with a morote-seoi-nage which was the only score of the contest. The Canadian, who came into the competition ranked ninth in the world, lived dangerously in the closing seconds as she kept her distance from her opponent and narrowly avoided receiving a third shido. 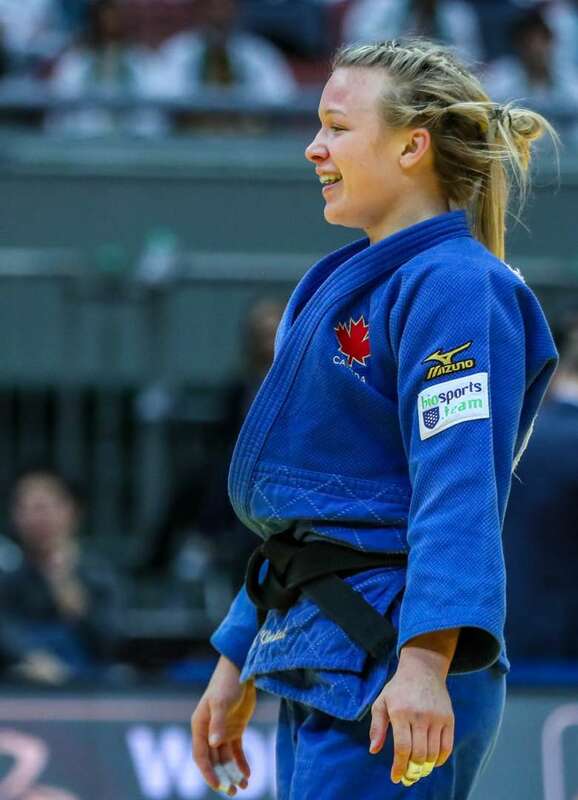 KLIMKAIT cried into the arms of her coach Sasha MEHMEDOVIC and is only the non-Japanese gold medallist after two days of competition in Japan. 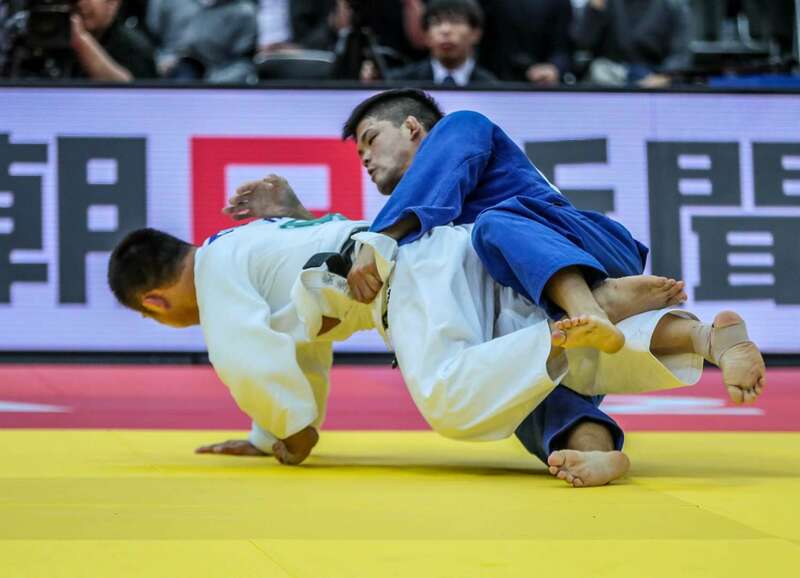 In the first semi-final TAMAOKI saw off world champion YOSHIDA Tsukasa (JPN) by a waza-ari which was the only score of their competitive contest. In the second semi-final KLIMKAIT shocked Junior World Championships gold medallist FUNAKUBO Haruka (JPN) by a single waza-ari to secure a place in the final. 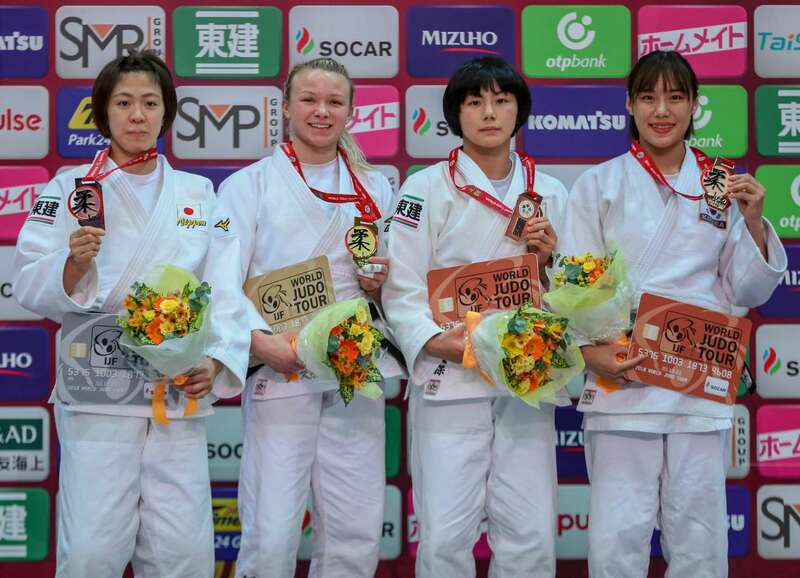 The first bronze medal contest was won by FUNAKUBO against world bronze medallist Christa DEGUCHI (CAN). 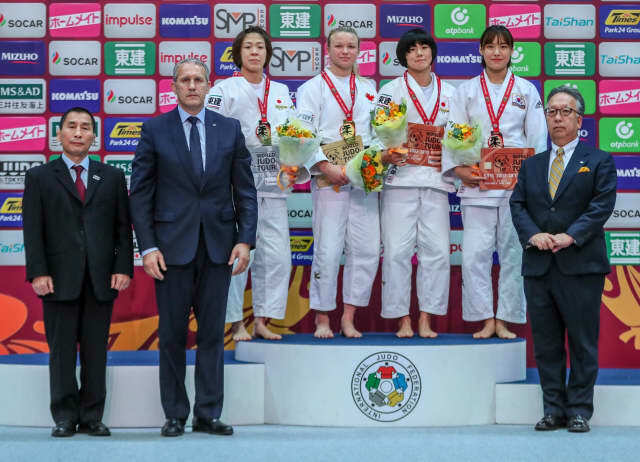 FUNAKUBO won her third Grand Slam medal in 31 seconds by ippon after DEGUCHI attempted to move from ne-waza to tachi-waza and the Japanese judoka was waiting. 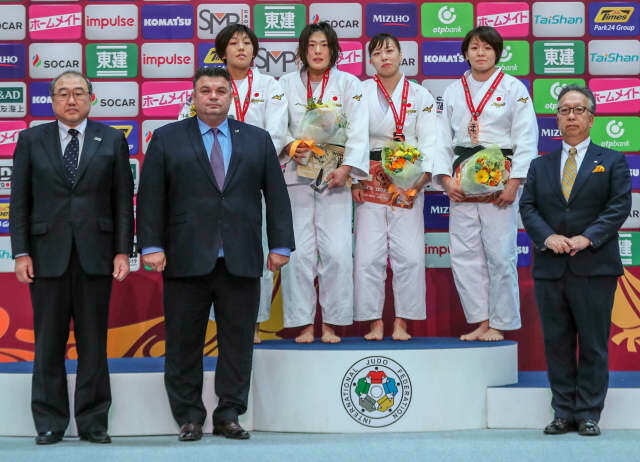 The second bronze medal was won by Hohhot Grand Prix bronze medallist KWON Youjeong (KOR) after YOSHIDA was disqualified with a direct hansoku-make. YOSHIDA endangered her opponent by trying to turn KWON over on the wrong side and the world champion had to settle for fifth-place. The Hague Grand Prix bronze medallist DOI Masako (JPN) topped the podium for Japan ahead of Asian Games winner NABEKURA Nami (JPN). First-time Grand Slam finalist DOI defeated 2017 Japan Grand Slam silver medallist NABEKURA in golden score after the latter was penalised for the third and final time for passivity. World number 72 DOI will skyrocket up the IJF World Ranking List and her win will shake up the selections for next year for the hosts. In the first semi-final Olympic champion Tina TRSTENJAK (SLO) was dispatched by DOI by ippon from a kami-shiho-gatame hold down in golden score. 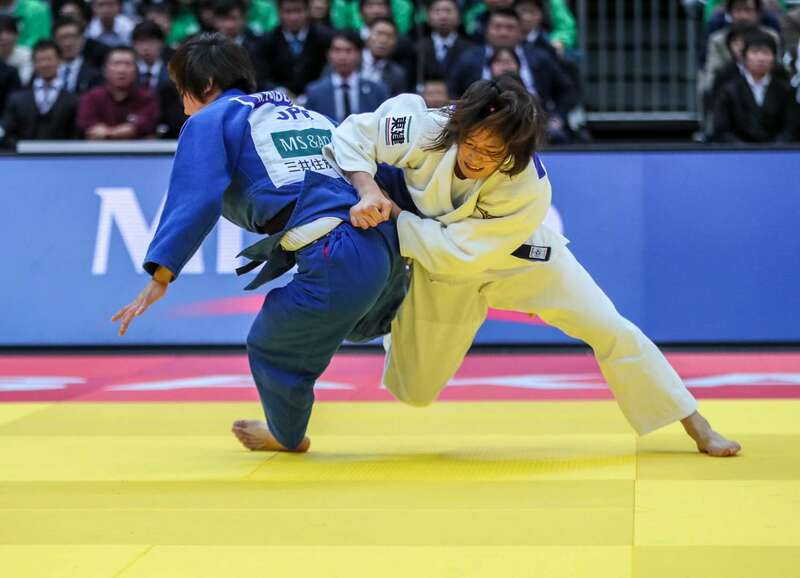 In the second semi-final Budapest Grand Prix winner NOUCHI Aimi (JPN) was penalised for the third time for going out of the area against NABEKURA Nami (JPN) and was disqualified. The first bronze medal contest was won by NOUCHI who submitted Ekaterinburg Grand Slam bronze medallist Edwige GWEND (ITA) with shime-waza. NOUCHI led by a waza-ari score from ashi-waza and wrapped up the contest for her third Grand Slam medal by subduing her opponent on the ground. The second bronze medal was won by world silver medallist TASHIRO Miku (JPN) who extended her head-to-head series against TRSTENJAK to 7-0. 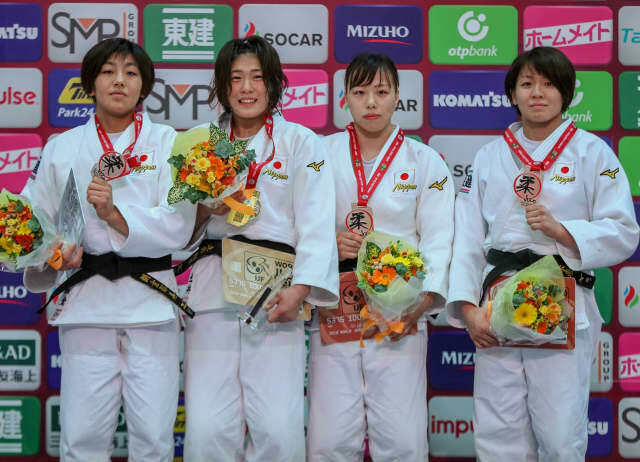 TASHIRO won her seventh Grand Slam medal by throwing for a waza-ari after five minutes and 21 seconds of golden score. Two-time and reigning world champion ARAI Chizuru (JPN) was peerless in the -70kg category as Japan concluded day two with gold. World Judo Masters bronze medallist Anna BERNHOLM (SWE), who had to beat two Japanese judoka to get to the final, will now break into the world’s top five after losing out by a single waza-ari score in a close final while ARAI is the runaway leader at the helm of the category and can already be pencilled in as the favourite for Olympic gold at Tokyo 2020. In the first semi-final Abu Dhabi Grand Slam winner Margaux PINOT (FRA) bravely attacked ARAI in golden score with a ko-uchi and it proved to be her downfall as the Japanese anticipated the attack and drove over her French rival for a waza-ari score with te-waza. In the second semi-final Asian Games winner NIIZOE Saki (JPN) fell to BERNHOLM after two minutes of golden score from a waza-ari as a result of an opportunistic o-soto-gari. The first bronze medal was awarded to NIIZOE who scored twice against World Championships bronze medallist ONO Yoko (JPN). World number 14 NIIZOE earned her third Grand Slam medal and can now expect some international trips to major events in 2019. The second bronze medal was won by PINOT who recorded a narrow win over double world medallist Maria BERNABEU (ESP) in golden score. France’s PINOT claimed her fifth Grand Slam medal after three minutes of golden score from an o-osoto-gari which was worth a waza-ari score. 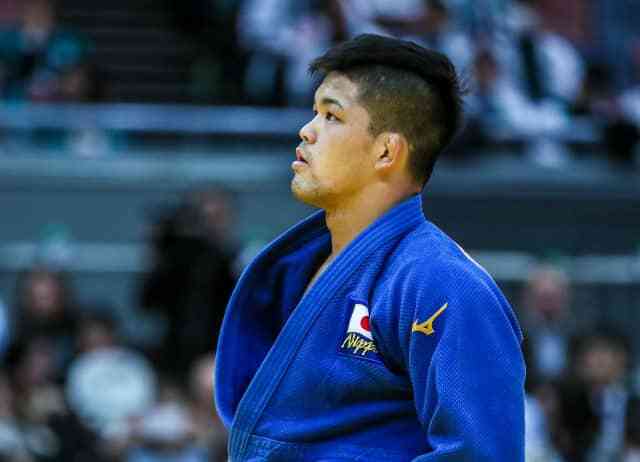 MEN -73kg: ONO pips EBINUMA in dream clash between Japanese greats Rio 2016 Olympic champion ONO Shohei (JPN) had the measure of three-time world champion and double Olympic bronze medallist EBINUMA Masashi (JPN) in arguably the best contest of the Osaka Grand Slam thus far. 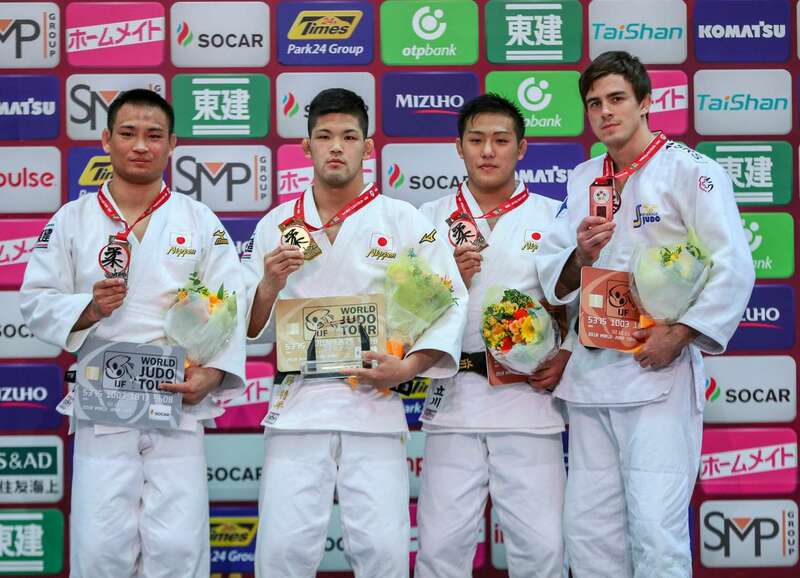 The long-time teammates have been rivals since EBINUMA moved up to -73kg earlier this year and ONO, the thrower of throwers, lost out to the -66kg ace at the All Japan Championships in April by ippon. ONO was flawless today while EBINUMA had to dig deep all day long. With 19 seconds left on the clock, ONO rolled over his rival for a waza-ari to win his third Grand Slam gold. In the first semi-final EBINUMA had to come from behind to defeat 2017 Tokyo Grand Slam silver medallist Arthur MARGELIDON (CAN). The Japanese great threw the Canadian with a seoi-nage for a place in the final after showing his character by remaining calm while behind and working his way back into the contest and into the final. In the second semi-final ONO saw off defending Japan Grand Slam champion TATSUKAWA Arata (JPN) by ippon with a buzzer-beating uchi-mata in the very last second. 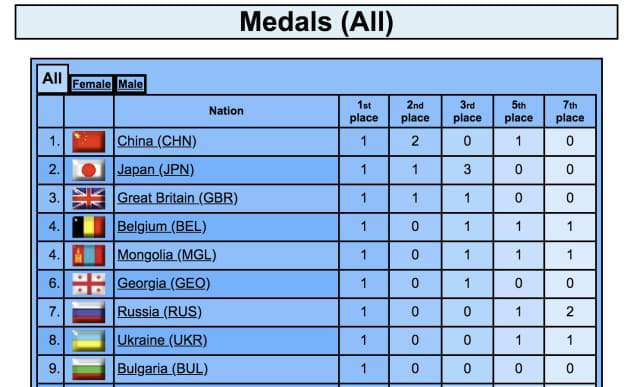 The first bronze medal was won by TATSUKAWA who beat Tunis Grand Prix winner Zhansay SMAGULOV (KAZ) in golden score. World number 34 TATSUKAWA won his third Grand Slam medal at the expense of Kazakhstan’s world number 11 who is still looking for an elusive Grand Slam medal. The home judoka outgripped SMAGULOV who was thrown after five minutes and 15 seconds of added time with ashi-waza for ippon. The second bronze medal went to Abu Dhabi Grand Slam bronze medallist Tommy MACIAS (SWE) who scored with five seconds left to beat MARGELIDON. Swede MACIAS won his fourth Grand Slam medal after throwing with sutemi-waza to avoid golden score. 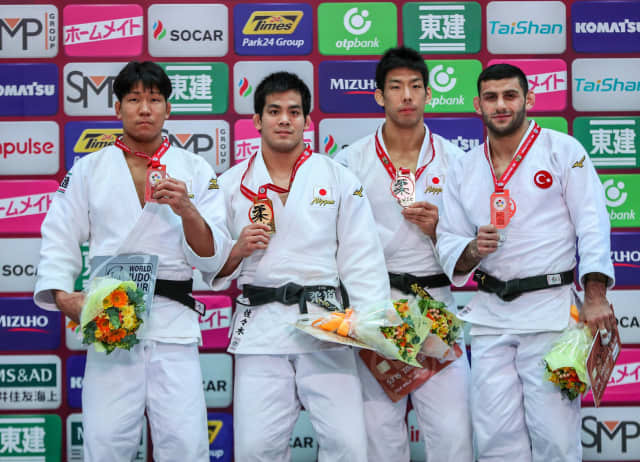 Hohhot Grand Prix winner SASAKI Takeshi (JPN) was the last man standing for Japan in the -81kg category as he beat Budapest Grand Prix silver medallist KOHARA Kenya (JPN) in the final. The Japanese pair cancelled each other out in regulation time but SASAKI took control in golden score and held down his colleague for 20 seconds and ippon to blow Japan’s battle for Tokyo 2020 wide open in a category which has not always served them well on the biggest stages in the sport. 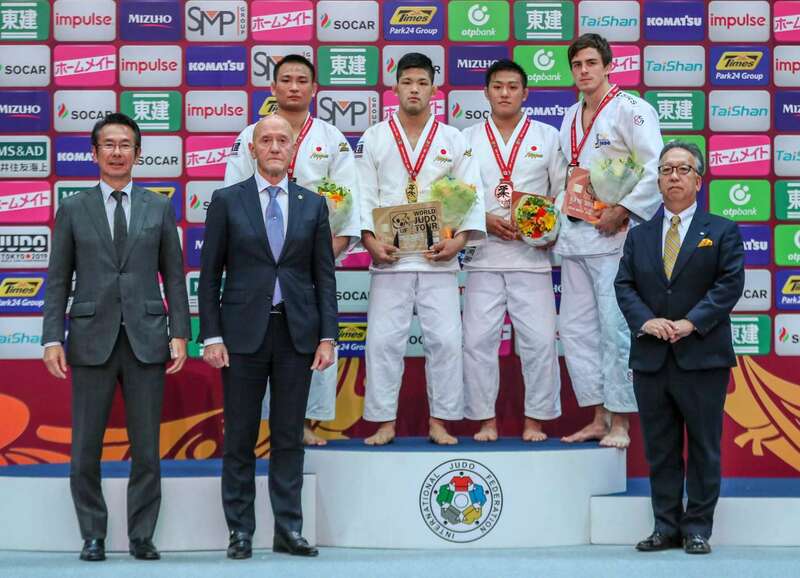 In the first semi-final SASAKI thwarted Zagreb Grand Prix bronze medallist Anri EGUTIDZE (POR) as he countered the Portuguese for a waza-ari and added a second with a hold down from a mune-gatame. 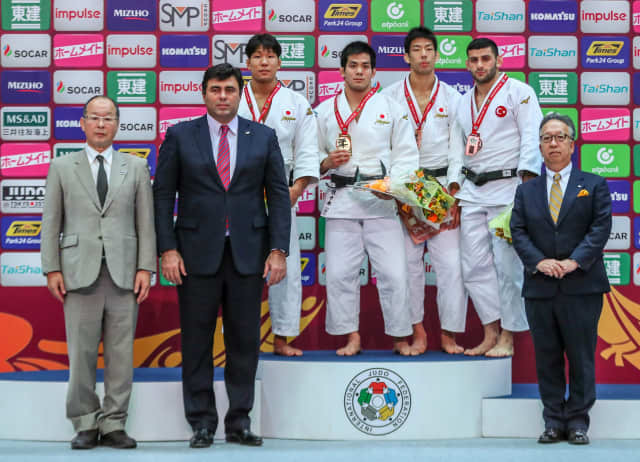 In the second semi-final KOHARA downed Tashkent Grand Prix bronze medallist Vladimir ZOLOEV (KGZ) by ippon from an o-soto-gari after one minute to book an all-Japanese final. 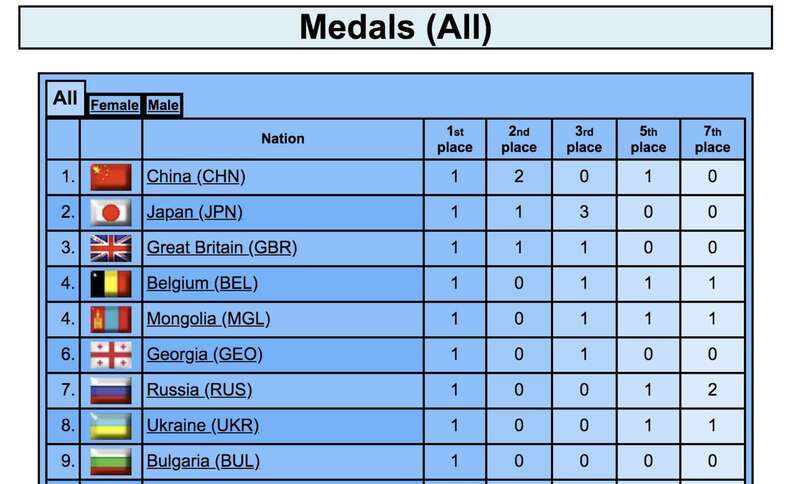 The first bronze medal was won by former world champion and Rio 2016 Olympic bronze medallist NAGASE Takanori (JPN). ZOLOEV was penalised for passivity to gift the Japanese his seventh Grand Slam medal and first IJF podium since his 2016 victory at the Tokyo Grand Slam. The second bronze medal went to world bronze medallist Vedat ALBAYRAK (TUR) who held firm against EGUTIDZE to prevail by a waza-ari score. It was a soft score to give away by the Portuguese who was rolled over the only score of the contest.